Food is God! 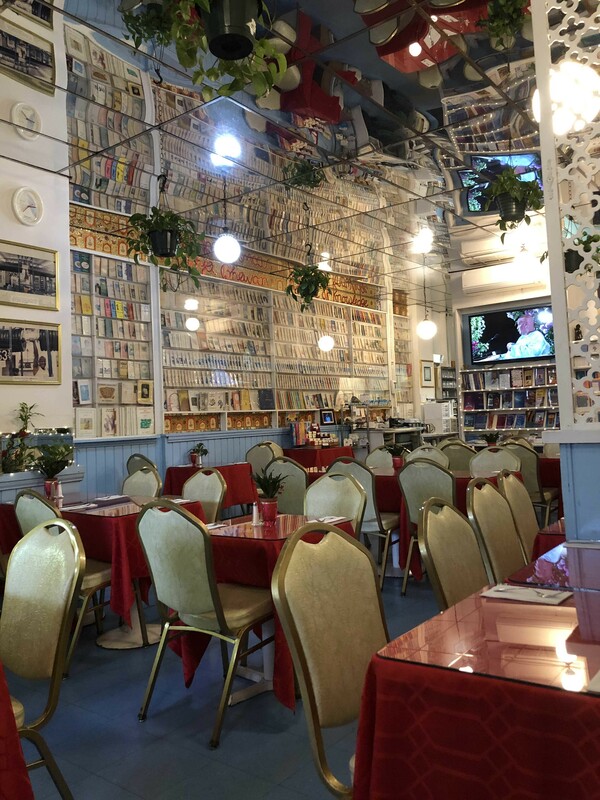 Annam Brahma: A cheap spot with good vegetarian and vegan options. Craving an afternoon snack after school? Need a place to go with friends on a Friday, but don’t have a big budget? Annam Brahma is the place for you. With a name that means “food is God,” Annam Brahma is is a vegetarian/vegan restaurant serving delectable Indian food, burgers, salads, and more. Being a short eight- minute walk from Edison and quite cheap, it’s an ideal spot for any high school student, yet not many know about it. I started off my order with an order of their samosas off their appetizers section. The order comes with two potato-filled Samosas for $3.50. The outside of the samosas were on the crispier side and were a little difficult to eat due to my braces, however the inside potato filling made it worth it. The potatoes were well cooked and seasoned nicely, pairing well with the chutney they came with. I continued my order with their Masala Dosa and their “Meatball” Hero (Soy) without the cheese. 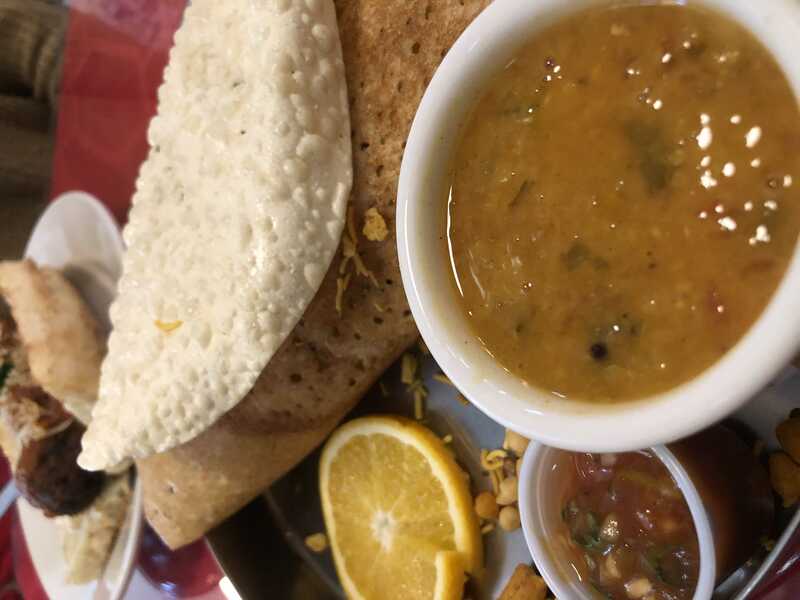 The Masala Dosa was $8.25 and consisted of a rice and lentil crepe which was filled with potatoes and curry and was served with chutney and sambar. The “Meatball” Hero (Soy) came with soy meatballs, tomato sauce, and I asked to leave the cheese out. The hero was $6.95. The soy meatballs were cooked wonderfully and tasted great, however they were on the sweeter side. However, the tomato sauce helped to balance out the sweetness. In regards to the Masala Dosa, I have no complains. The crepe was crispy and well done, a perfect pair to the soft and savory filling. The sambar that went with the dosa was good enough to be eaten on its own. I finished off my meal with their Homemade Vegan Double Rich Chocolate Cake. As the name suggests, the cake was very rich and chocolatey. The actual cake portion was a bit dry, however the chocolate frosting on top helped to even this out. The cake was on the sweeter side, however the sweetness was not too overpowering. Overall, going to Annam Brahma was a great experience and I am sure to go back. The one downside for any card users may be that they are a cash-only restaurant. However, they are open every day from 11am to 9:15pm expect Wednesday, when they are open from 11am to 4pm, and Sunday, when they are open from 12pm to 9:15pm. Being so affordable, close to our school, and delicious, it’s a hidden gem. Hello! My name is Harmeet Minhas and I write for the food section for The Edison Light. I chose to write for the food section due to food being something that can bring people together and play important roles in people’s cultures. I have been vegan for over six years and this gives me an excuse to try new restaurants that cater to those who partake in plant-based diets. Besides writing, my hobbies consist of dancing, cheerleading, and going to concerts!